The Reading Fightin Phils (12-7) defeated the Richmond Flying Squirrels (3-14), 6-4, at The Diamond on Wednesday afternoon. The loss extends the Squirrels’ franchise-record losing streak to 12 games, and also marks the fourth consecutive series in which the Squirrels have been swept. That also stands as a franchise record. Reading is now 6-0 against Richmond this season, and the Squirrels remain winless against the Eastern Division (0-9). The Squirrels now embark on a road-trip that will include series against the first place clubs in both divisions. Reading scored first for the third consecutive game, when they got to lefty Jack Snodgrass for a lone run in the second. Gabriel Lino sparked the Fightins with a one-out double to the left-field corner. Snodgrass induced the second out of the inning, but Brodie Greene made it 1-0 Reading when he pulled a single through the left-side of the infield. The Squirrels awoke offensively against lefty Jesse Biddle in the fourth. The Squirrels got four consecutive singles to start the frame to take a 2-1 lead. Mitch Delfino started the inning with an infield-single. He advanced to second on a throwing error, and scored when Devin Harris lined a single into right field. Ricky Oropesa followed and also singled to right field to put runners at the corners. Javier Herrera then singled back through the middle to plate Harris for the lead. Eliezer Zambrano followed and laid down a sacrifice-bunt to put runners at second and third, and Rando Moreno tacked on a run with a sacrifice-fly to center field. Greene got Snodgrass for the second time as he led off the fifth. He doubled to the left-field corner. Biddle bunted him to third and he scored on a wild-pitch from Snodgrass to trim the Richmond lead to a lone run, 3-2. Snodgrass rekindled the inning when he issued a two-out walk to KC Serna. Aaron Altherr followed and cranked a double to right-center field. Serna scored to knot the ballgame, 3-3. Richmond forged back in front in the fifth, as Biddle issued a leadoff walk to Kelby Tomlinson. Tomlinson advanced to second on a passed ball and moved to third on a ground ball to the right side. Delfino brought him in for a 4-3 lead with a sacrifice-fly to deep left field. Biddle (3-0) called it a day after five innings. He was charged with four runs, three earned, on six hits. He walked one, struck out three and was handed the win, his third. Snodgrass returned for the sixth inning and quickly notched the first two outs of the frame. However, Gustavo Pierre poked a two-out single into right-center field and Greene followed with his third hit of the day off Snodgrass. His second double yanked into the left-field corner scored Pierre to tie the game, 4-4. It also chased Snodgrass from the ballgame. Right-hander Jose Casilla came on for him and promptly uncorked a wild-pitch that moved Greene to third. Harold Garcia then pinch-hit for Biddle and drubbed an infield-single to third base. Greene scored for a 5-4 lead. Snodgrass (1-3) allowed five earned runs over 5 2/3 innings. He conceded eight hits, walked three and struck out two. He suffered his third consecutive defeat. Reading used three relievers to make the lead stand up. Lefty Ethan Stewart ripped through a perfect sixth inning, while fellow lefty Elvis Araujo worked two nearly flawless innings in the seventh and eighth. Right-hander Nefi Ogando pitched around some minor trouble in the ninth to earn his first save of the year. The Fightins tacked on an insurance in the top of the ninth. The run was charged to righty Tyler Mizenko. The Squirrels enjoy an off day on Thursday. They open a three-game series against the New Britain Rock Cats (Colorado Rockies) at New Britain Stadium on Friday night. First pitch of the opener is scheduled for 6:35 p.m. 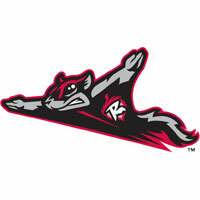 The Flying Squirrels Pregame Warmup will begin at 6:00 p.m. on Fox Sports 910 and FoxSportsRichmond.com.